Following up the violent selling days that the cryptocurrency market has gone through the past week, Saturday started-off very brightly for traders and investors as almost all coins are on the green-gaining zone now with many experiencing double digits growth. The one standing out is Nano [NANO – Rebranded from RaiBlocks recently] as it is trading at $11.80 with 25.30 percent gain in the last 24-hours being the highest in the top 25 cryptos by market capitalization. It is very strongly recommended to keep on radar the levels at which the prices in general dropped more heavily during March 8, as for the moment these are showcasing strong resistances to be cleared in which case [if it happens] more gain could be guaranteed for the continuation of the weekend. 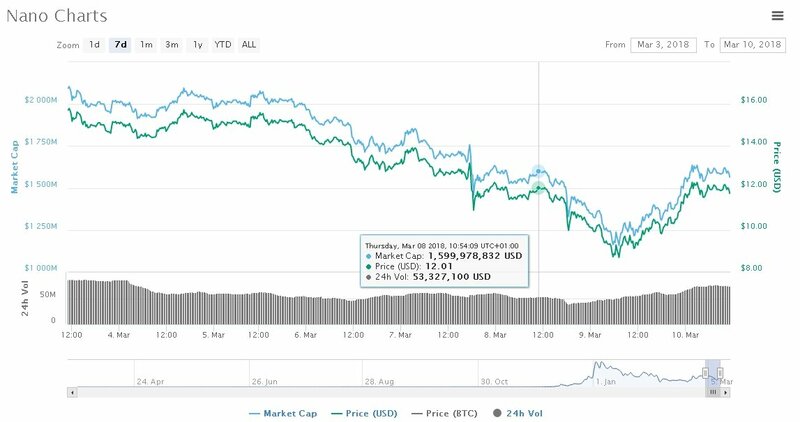 Accordingly to the price of Bitcoin [BTC] all coins dipped very low, with the pair NANO/USD touching the $8.00 mark for the first time in almost three weeks. However, this could have been the best opportunity to step-in as prices this low might not be seen for a while now if we base our conclusion from what took place the previous years during this time of the year. When it comes to the price fall, Well, for a start, there is the fact that in the recent past, countries have been passing crazy laws aiming to regulate the crypto market. The latest was an announcement by the U.S that cryptocurrencies would now be subject to the same rules as other securities, such as stocks and commodities. This means that cryptos are now subject to taxes that were hitherto unheard of in this market. As a result, the market sentiment has turned bearish, as investors try to figure out the impact that these developments might have on the market. Then there is the emerging story that authorities have found the people who hacked MtGox and confiscated their bitcoins. The story is that the U.S authorities confiscated the private keys of these bitcoins and is disposing them at a throw away price. That’s over $1 billion worth of bitcoin entering the market all at once. But, seeing that the prices are returning and can hold their ground [the leading ones even more] highlights out that there is still confidence in the community and ecosystem. The very respected and famous founder of Litecoin – Charlie Lee, gave his support to Nano, its technology and the idea behind the platform. However, many LTC enthusiast did not like the fact!